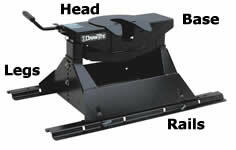 There are four main components in a Fifth Wheel Hitch. The hitch head, the base, the legs and the rails. The hitch head is the section that has a jaw that funnels the trailers' king pin so a secure connection can be established with the pickup, the Fifth Wheel Hitch and the trailer. The base is what the head rests on. Some Fifth Wheel Hitches can pivot fore and aft, some can also pivot side to side on the base. The legs are what attach the base/hitch head combination to the rails. The rails attach the Fifth Wheel Hitch to the pickup bed. Some Fifth Wheel Hitches have in bed rails and some have under bed rails. Data generated in 0.001232 (s) from 6 queries.